Buying and collecting art? Majorly fun. Figuring out where to hang everything? Sometimes not so fun. 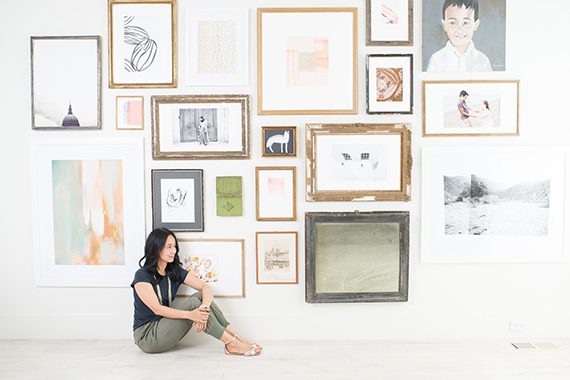 If you’re like me, you’ve probably come across a ton of inspiring images of art-gallery walls on Pinterest or in shelter magazine with walls fabulously filled to the brim with beautifully framed pieces. But attempting to create something similar at home can be a little intimidating. 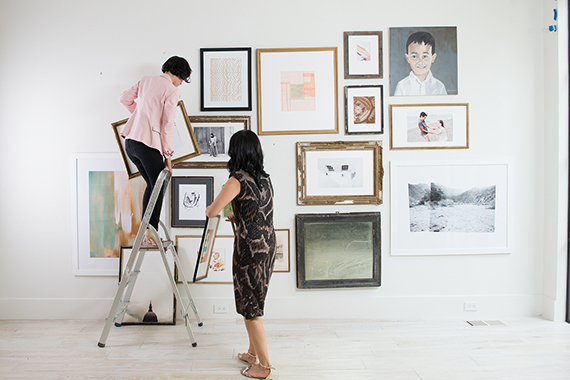 To inspire you to create an art-gallery wall of your own, we dropped by the homes of two Minted employees: our founder and CEO Mariam Naficy (top) and associate creative director Annie Clark(bottom). 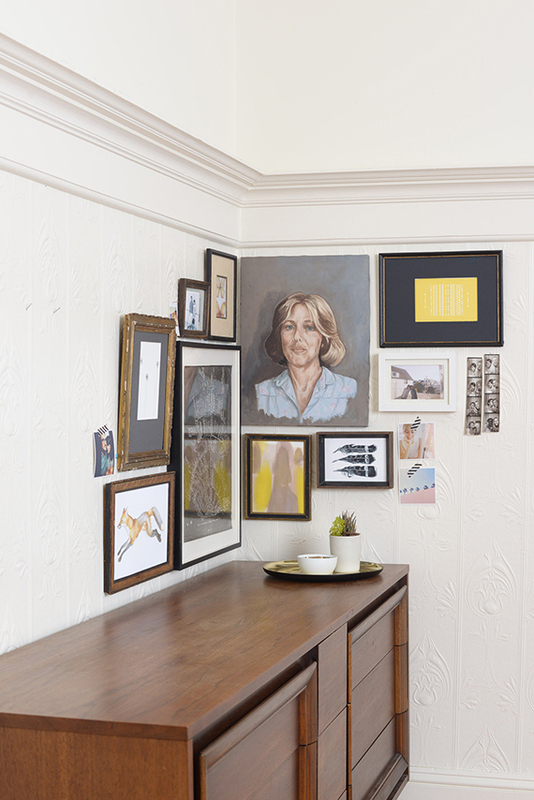 San Francisco-based stylist Rosy Strazzeri-Fridman worked with the ladies to create gallery-wall displays that perfectly suited their individual styles. Here, she shares her best advice and tips. 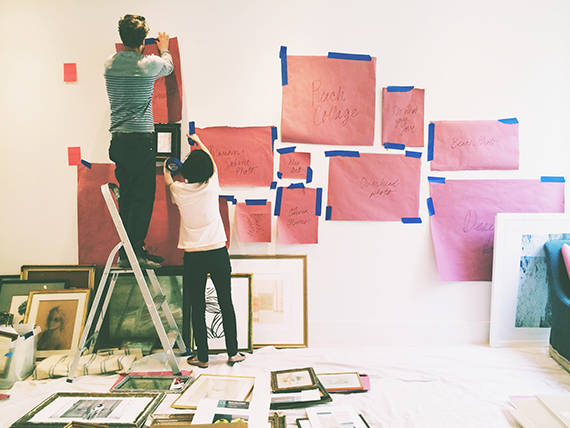 So dig through your closets, pull out those pieces you’ve been meaning to have framed, and get hanging! Step 1: Collect pieces to display. • Gather your favorites: Art Prints , paintings, photographs, drawings, sketches, your kids’ artwork, personal photos and Polaroids. Aim for a nice mix of high and low pieces, and don’t hesitate to think outside the box—basically anything that’s significant to you should be considered: maps from your travels, ticket stubs, fabric swatches, concert posters, a page torn from your favorite book, antique mirrors, cool trivets, and even favorite knickknacks. Step 2: Choose a wall. • If your style is more quirky and untraditional, consider a corner arrangement where the frames wrap from one wall to the next, as seen in Annie’s art display (above). Step 3: Figure out the perfect layout. • Make it your own. If you feel like a print will look better cropped a certain way, go for it. Buy a several different-size picture-frame mats and re-crop the piece however you like. “Many artists do this themselves, so don’t feel like you’re offending the artist with your new composition,” says Rosy. • Save yourself the frustration—and your walls the trauma—of hanging, re-hanging, and re-hanging again. 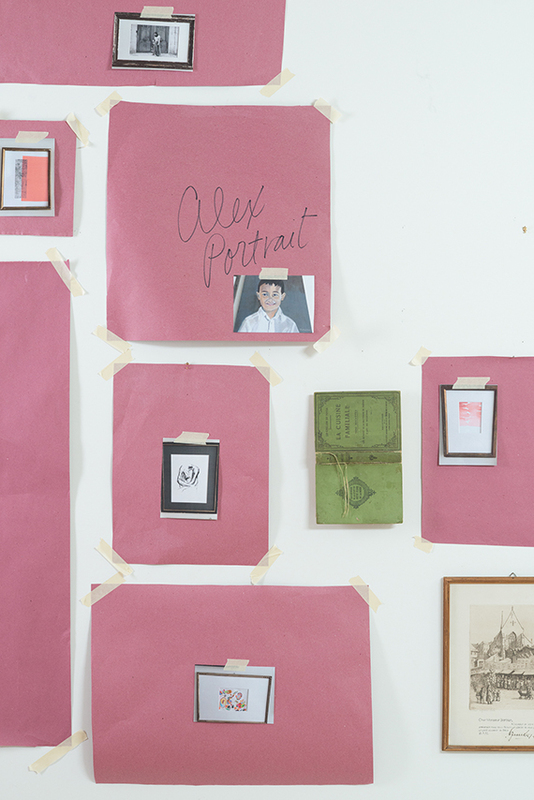 Instead, trace each frame on kraft paper, label the tracing, and cut it out. Snap quick photos of each piece of art with your cellphone and print them out in color; tape each to its corresponding kraft-paper tracing. “This will help give you a sense of scale and color balance on the wall as you figure out the perfect arrangement,” says Rosy. 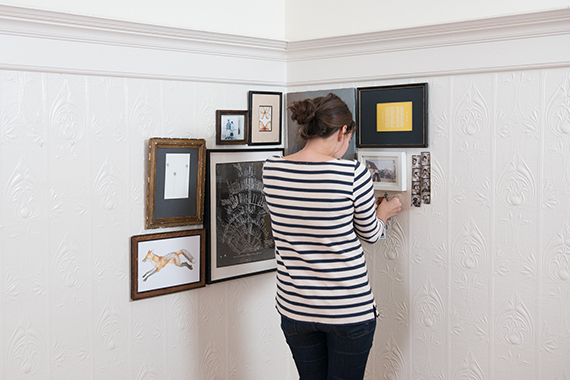 Then, use blue painter’s tape to try out placements and arrangements without covering your walls with holes. • If you’re working with a large blank wall, begin with your largest piece of art and position it to the bottom and left, then work up and outward to achieve a visual balance. If you want a centered arrangement (say, if you’re hanging artwork above a sofa), place the most prominent piece at eye level in the center and work outward. • Play around with different arrangements until you find one you really like. Take a step back from time to time and look at the overall composition from various spots and angles in the house. When you’re happy with your layout (this can take anywhere from 10 minutes to several days! 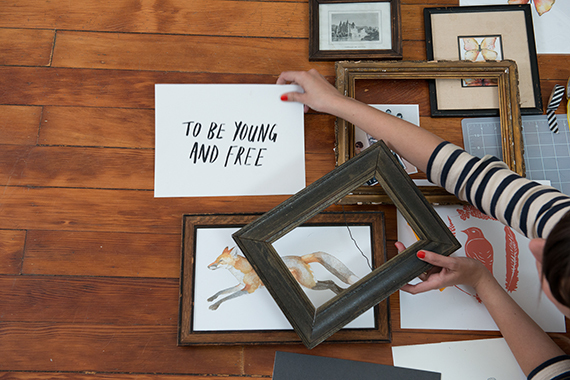 ), you’ll be ready to hang the originals. • Replace each paper template with its corresponding framed piece and hammer the nails and picture hooks in place. Voilà, you’re done!